3-David Murray was born on 22 Jan 1786 in Old Greyfriars, Edinburgh, Midlothian, Scotland and died on 4 Sep 1837 in Launceston at age 51. 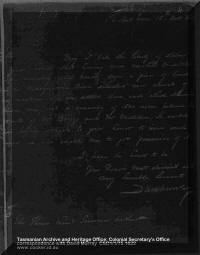 David's early life and plans for emigration are outlined in the Murray Clan section. He kept a diary and much can be learnt from it of his first few years. One incident of the voyage out is given in his diary. When off the Madeira's, an American barque came up to them. The skipper came on board the Portland and David Murray was invited to the Captain's cabin to meet him. The two flags, American and British, floated together for about two hours, The Portland called at Rio de Janeiro, and also at Cape Town. The Hobart Town Gazette of September 10th, 1824. Mr. Thomas Binnie Mr. Alex. Rose. 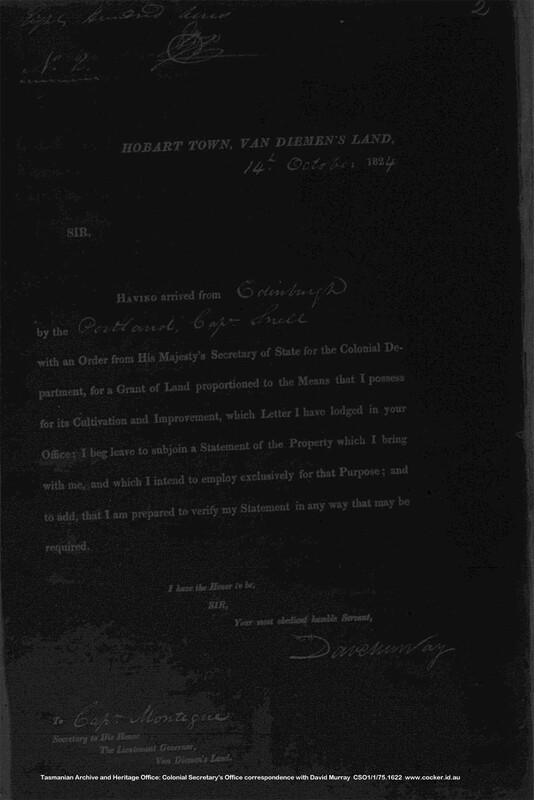 Having arrived from Edinburgh by the Portland, Captain Snell with an Order from his Majesty's Secretary of State for the Colonial Department for a grant of land in proportion to the means that I possess for its cultivation and improvement which letter I have lodged in your office; I beg leave to sub dual in a statement of the property which I bring with me, which I intend to employ exclusively for that purpose; and to add, that I am prepared to verify my Statement in any way that may be required. Mr. Reid having begun replowing the field at Fergussons hut which I have taken from him for 6 months, I sowed today 1and a quarter acres of barley which I bought from Underwood. Saw Mr. Buist. Mr. Reid returned from Corney's. Wrote Champion and Co. to sort, pack and press my wool and ship it by the first vessel, addressed to W. Purves. He observed his first birthday in Van Diemen's Land by having dinner with Hugh, Jane and Mrs. Reid at dinner. Mr. Reid came later. On 7 Feb 1825 he proudly recorded Laid foundation stone of my house at my own land, to be 30 feet by 20 feet clear. The wall to be 2 feet thick. Barney Trainer, builder, as written agreement. He named the house Twickenham. William and I began our harvest, which would have yielded a fair crop, but for the thousands of paraquets which have almost consumed it. We reaped 14 sheafs. Marsh arrived with box of books. Opened box of private books, list given 145 volumes. Mrs. M. and children with Hugh went to farm with Mr. and Mrs. Reid, who were on their way to New Town. Dined in the tent. William today picked off 23 best ewes for his years wages. ending 10 Sep. next earmarked them and pitched M. on the hip. Cart went to the tier yesterday for weatherboards, returned today with 173. Sent to farm some potatoes and 5 bush. of wheat, also Robert's, William's and Henry's trunks. Got loan of four bullocks from Hugh, one cart from Mr. Reid, to assist in driving wood from the tiers. Thomas's birthday, dined with all the family in Hugh's. Hugh, Jean and McRobie at dinner. A severe frost last night which blackened all the potato straws. Dined at Hugh's. Marion walked to and from it. Very rainy day. Cart came to take down our things to farm. He staid (sic) all night with Bill the sawyer; he took down two loads. Journeyed to our own land with one loaded cart, the servant and two elder children on top, Mrs. M Walking and myself carrying Andrew. We rose today all well, though our humble apartment was very damp. I went to Mr. Robertson's (Riccarton) today. Got some .. more plants, put them in with some swedish turnips. On 14 April 1825 he moved his possessions by cart to his new house, which was still not finished and very damp. Hugh had been waiting for this and Hugh, David and Robert Young all went off to Hobart on various urgent business. On 26 April they set out with ten bullocks. The first night was spent at Cobbs (Blackman's River) and the second night at Widings (Macquarie Springs) where one slept on a form and the others on the floor in their clothes. The third day they took a horse and cart to Green Water Ponds (Kempton) for the night. In the morning by horse and cart they made it to within fourteen miles of New Town from whence they walked on via Morris' ferry and reached town at seven p.m. on 29th. They stayed with William Young that night. On the way to town they had to rely mostly on credit, each sharing expenses and the total came to sixty-four shillings. David lost twelve shillings on a payment he made with twelve sovereigns, which annoyed him. On the way home, after making some financial arrangements, all was paid except for a bill at Ross Bridge. He reached home on 14 May after quite a trip to find all well and home much advanced except that rain was still not fully excluded. Two days later a carpenter arrived from the government and work proceeded faster. During August that year he faced his worst crisis when his wife Marion became ill and he was 'despairing of her life' for two days but her own stamina brought her through. By the end of the month she was well enough to go with him to visit his brother Hugh. In crossing the river which was deeper than expected the bullocks had to swim and they had a lucky escape from drowning or at least a ducking. During the spring some of the highlights of their time were in visiting one another and admiring the improvements. 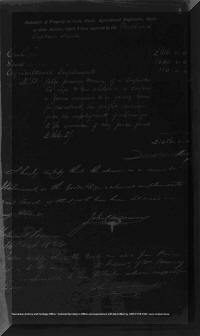 Called at Youngs to condole with Mrs. William Young on the serious robbery she suffered with bushrangers on Monday last. 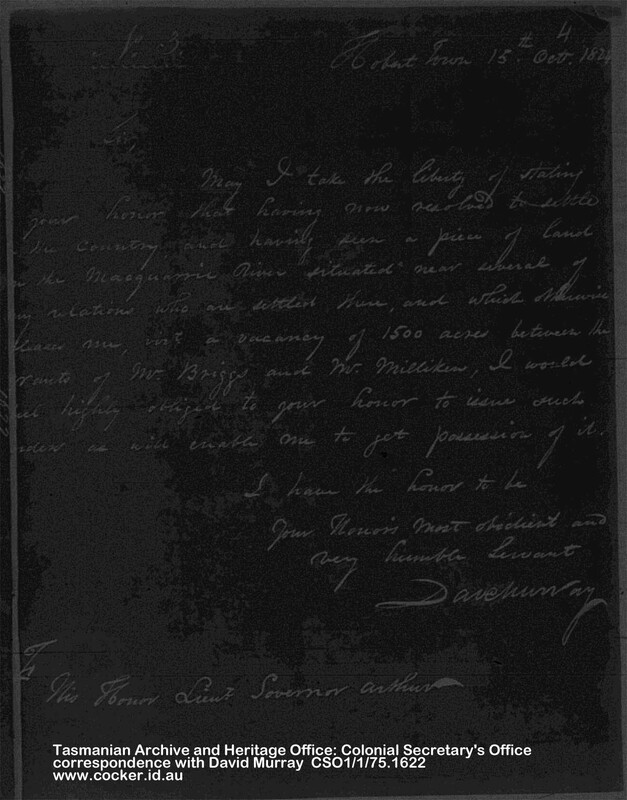 Note from Mr. Willis summoning me to go to his house to pursue bushrangers—I reached his house at eight p.m. having lost my way in the bush—they thought I was a bushranger and received me under arms. Went with William Young to the fair (Ross Bridge). A good show of stock and gentlemen but scarcely any sales. 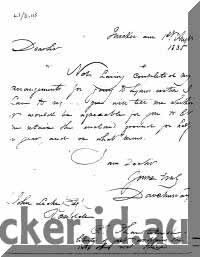 David arrived on 10 Sep 1824 and on 14 Oct 1824 he applied for a grant of land as above. He was granted the 800 acres that had been reserved for him alongside his brother Hugh's grant on the Macquarie River but it did not please him. So he selected his 800 acres elsewhere on the Macquarie between locations to J. F. Briggs and William Millikin. 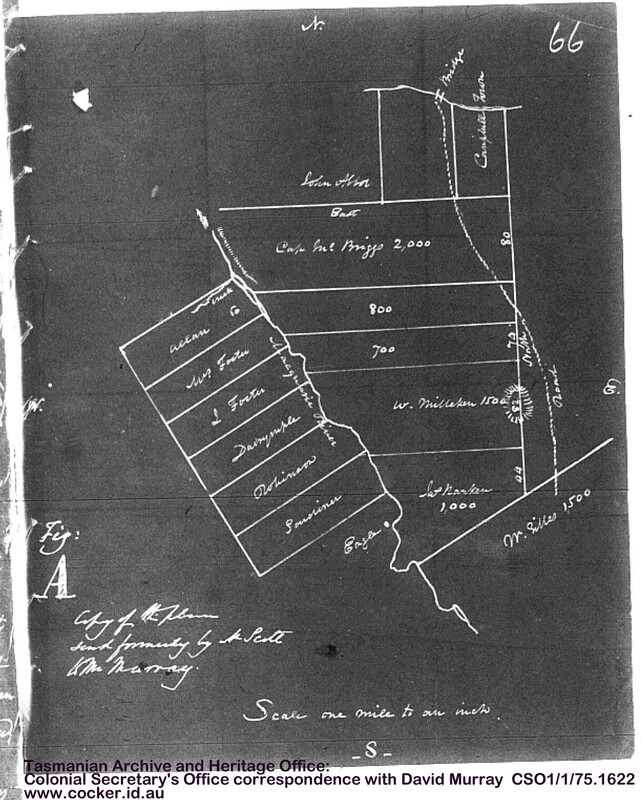 The plan shown to him by Thomas Scott, Assistant Surveyor, indicated that there was ample room for him to select his grant between these locations with an adequate river frontage. May I take the liberty of stating your honor that having now resolved to settle in the country, and having seen a piece of land in the Macquarie River situated near several of my relatives who are settled there, and which otherwise leaves a vacancy of 1500 acres between the grants of Mr Briggs and Mr Milliken, I would be highly obliged to your honour to issue such orders as will enable me to get possession of it. From the perusal of these papers it appears that Mr Murray has been an industrious resident settler. I therefore approve his receiving the 500 acres, more or less, which are situated between his grant and Mr Millikens as an additional grant of land which is to be date 1st Jan 1828. This meant David had finally been allocated the full 1500 acres shown on the plan between the grants of Briggs and Millikan. However disaster was about to strike. By 1830 David was impatient to get the boundaries property properly marked out and, despairing of a government surveyor ever being available to work, he hired a contract surveyor named Malcolm to do the work. He was horrified to learn as a result that most of the improvements, including his house, lay within the boundaries of Brigg’s land. 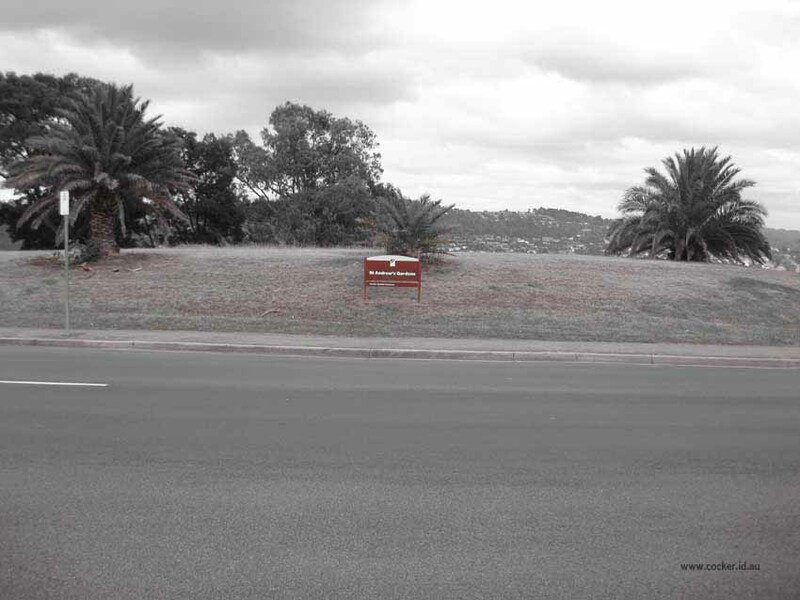 He immediately arranged for a government surveyor, John Helder Wedge, to check Malcolm’s survey. Wedges survey showed that even more of what Murray thought was his land lay within Brigg’s grant. Murray admitted that his neighbours, including Briggs, had warned him against building on the site he had selected, it not being his land, but he had claimed he had ignored their advice because he felt it was prejudiced, his neighbours being interested parties. Murray addressed frequent communication to the government urging that he should receive some protection from Briggs' threats to sue him for trespass. 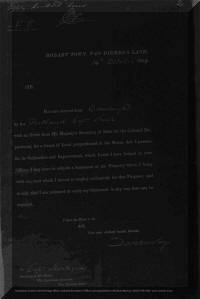 Here is a copy and transcript of one such letter dated 10 August 1830. The case hinged partly on whether or not the survey chart shown to David Murray in 1824 by Thomas Scott (above) had been a sufficient assurance on the part of the government to Murray that there was unlocated land between grants to Millikin and Briggs of sufficient area to allow him to take his grant with a 74 chain river frontage. Thomas Scott insisted that he had advised Murray not to improve the way near either of the supposed boundaries, but to build and cultivate near the centre of the frontage until an exact survey had been made. Murray declared that he had no recollection of receiving such a caution. In later years it was discovered that the surveyor who have measured out Millikan’s grant had made an error by 10 chains. This meant that the rough plan of the area which had been shown to Murray in 1824 was in fact reasonably accurate after all. However this was not discovered soon enough and Millikan’s grant had already changed hands and any late attempt to correct it would inevitably have resulted in costly litigation. The governor was unable to determine exactly who had been at fault. Meanwhile Hezekiah Harrison had purchased Merton Vale, Brigg’s estate and in 1831 acting upon advice from George Frankland, Surveyor General, the government granted Harrison an additional 300 acres near Campbell Town (see map below) to as compensation for the corner of his land upon which David Murray had erected his buildings. Harrison then agreed to abandon his claims against Murray. However David Murray persisted in regularly complaining that the government had treated him unfairly and demanded additional land in compensation. The government continued to resist his claims until eventually David decided to leave the land. He started business as a wine merchant in Launceston and eventually gave up his land and moved there. He tried unsuccessfully to sell his remaining land and house. In 1833 he offered his brewery for sale. The Campbell Town Brewery and House. The above property comprises a very comfortable House, &c &c The Brewery consists of a malt floor 90 feet long by 10 feet wide, the kiln 12 feet square, with brewhouse and cellar capable of containing 40 hogsheads; also, men's hut, an excellent three-stalled stable, fowl house, piggeries, with a large garden stocked with young fruit trees. The whole at present let to a respectable tenant, at a rent of £80 per annum. For further particulars apply to Mr. David Murray, Twickenham by Campbell Town; or to the tenant on the premises. July 10, 1833. 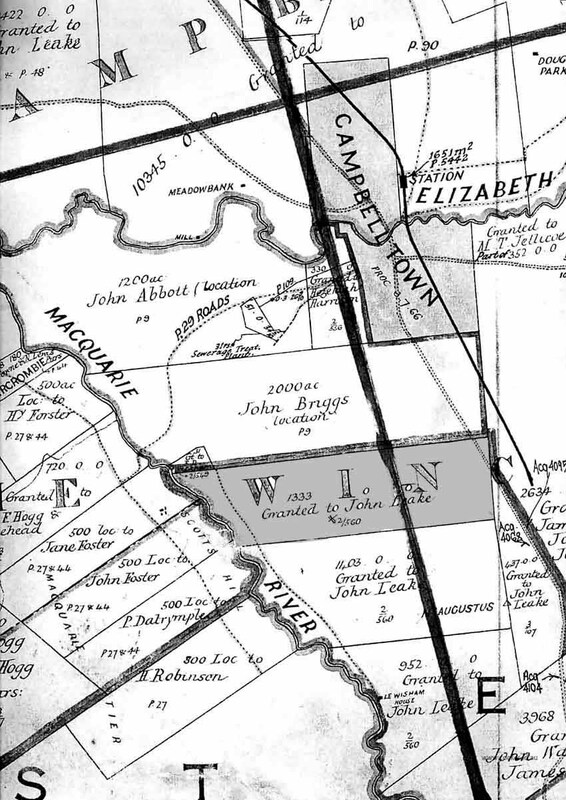 Map showing Twickenham to the left of the Midland Highway just below Campbell Town. David was licensee of the York Wine Vaults in York Street Launceston. 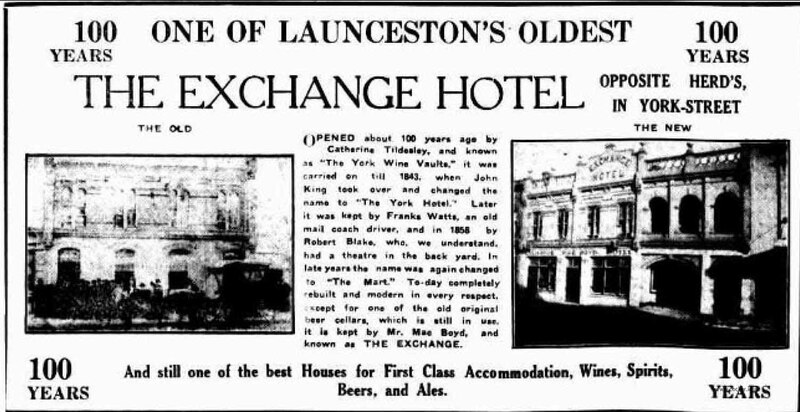 This advertisement in the Launceston Examiner on Saturday 12 March 1932 is not entirely correct. "OPENED about 100 years ago by Catherine Tildesley, and known as "The York Wine Vaults," it was carried on till 1843, when John King changed the name to "The York Hotel." Later it was kept by Frank Watts, an old -mail coach driver, and in 1858 by Robert Blake, who, we understand, had a theatre in the back yard. In later years the name was again changed to "The Mart." To-day completely rebuilt and modern in every respect except for one of the old original beer cellars, which is still in use, it is kept by Mr. Mac Boyd, and known as THE EXCHANGE." In fact John Tildesley took over in 1840 from Daniel Judson. The hotel stood slightly back from the road on the North side of the Street, midway between Charles and St John Streets. In June 1837 David was required to appear before the Police Magistrate. There had been ongoing concerns that many landowners were harbouring absconders and accepting small losses rather than vigorously pursuing and reporting bushrangers. A number of prominent landowners were charged and as part of this crackdown by Police Magistrate John Whitefoord attempts were made to stamp out killing livestock and selling the meat without a license. Hence, Whitefoord heard a case on 23 June 1837 against David Murray who was frequently absent, tending to his business as a wine merchant in Launceston. However, he was still responsible for the activities that took place on his property. Whitefoord received information that Murray had been killing and selling meat without a license. Other respectable settlers had also been charged at different times with flouting this unpopular regulation, but with Murray absent there may have been a concern that his farm had become friendly to absconders and was supplying black market meats to the hut keepers who were sheltering them. However, although David Murray was called to appear before the magistrate the information against him was withdrawn and the case was dismissed. Whitefoord had worked hard to choke off the trade in essential supplies. He had put the district's middle class farmers on notice that he expected them to be responsible for closely scrutinizing all the activities that took place on their farms. He had forced those masters who were willing to accept small commercial losses as part of the free enterprise costs of their farms, to re-establish the penal nature of their control over their convict workers in place of the less formal traditional master and servant relationships that started to appear on some farms in the area. John Leake and Louis Gilles both came to Van Diemen's Land in 1823 on the ship Andromeda. 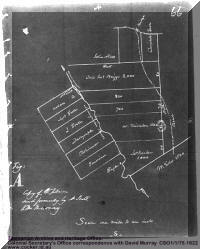 Records show that L. W. Gilles sold land to John Leake in 1833. Gilles' land included 1400 acres previously sold by David Murray to Gilles. 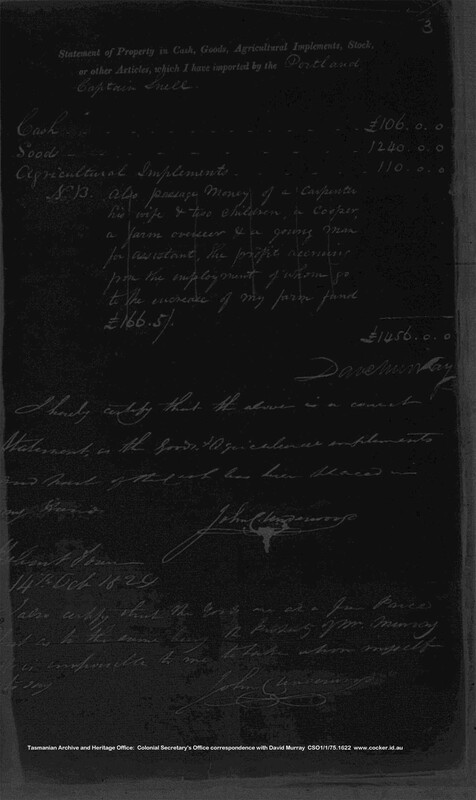 Registration of the grants to Leake was delayed because of a disputed boundary on Murray's grant and a claim for improvements made before his sale to Gilles, including dwelling house and outbuildings, but grant deeds were issued to Leake in 1843, after payment of fees and quitrents, for 1403 acres (originally Milliken), 952 acres (originally Rankin) and 1333 acres (originally Murray). 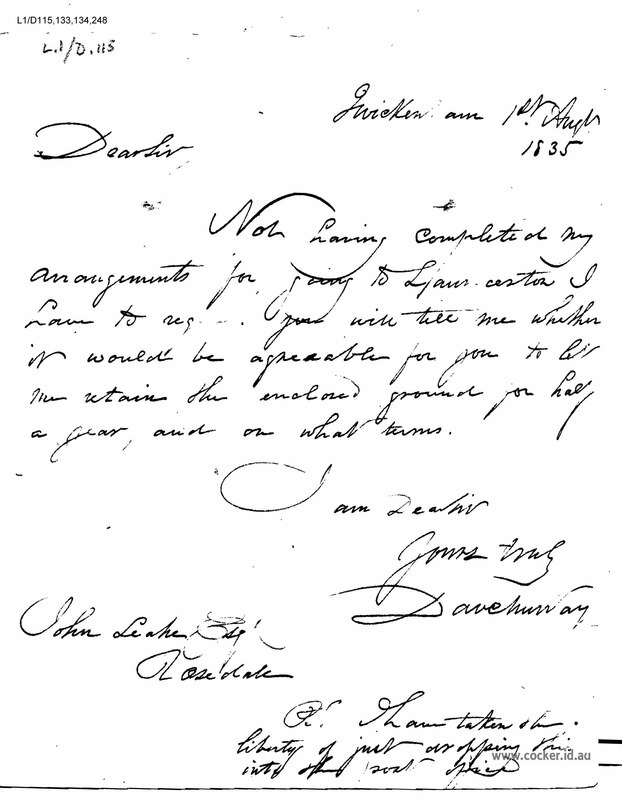 David employed about six men but in 1835 was ready to leave Twickenham as evidenced by this letter he wrote to John Leake. Now having completed my arrangements for going to Launceston I have to request you will tell me whether it would be agreeable for you to let me maintain the enclosed grounds for half a year and on what terms. Villa and Unlocated Grant for sale. The Villa of Twickenham, on the Macquarie river, within three miles of Campbell town and five of Ross, will be Sold or Let. The house is well adapted for a -respectable family or academy-it contains seven apartments, the dining room being 24 x 48; outside, and contiguous, are kitchen, two servant's rooms, washing house, dairy and lumber house, a weather-boarded hut, stable, barn, fowl-house, sheds, yards and piggeries, with between 80 and 40 acres of cleared land, fenced" and subdivided-a garden and policy with three acres filled with fruits and vegetables. Prime working bullocks, two superior mares, carts, ploughs, harrows, &c. Between 200 and 300 bushels clean wheat, some barley, a stack of hay and straw, and 1 and a quarter acre potatoes of finest quality. Also, an unlocated order for 300 acres of land. 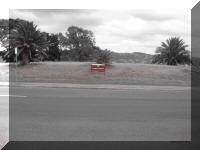 Apply to the undersigned, on the premises, if by letter (post paid) addressed Campbell town. However it was not sold by the time he died intestate in Launceston on 4 Sep 1837. He was buried in the Scotch Cemetery, probably St Andrews in High Street which is now a somewhat barren park. In the Administration of David Murray, heretofore of the Macquarie river in Van Diemen's Land, Farmer, and late of Launceston in Van Diemen's Land, aforesaid, Wine Merchant, deceased, to the next of kin of the said David Murray and to all christian people. " GREETING.-You and each of you are hereby cited and warned that you be and appear in the Supreme Court of Van Diemen's Land, on Monday the 4th day of November now next ensuing, at the Court house, in Hobart town, aforesaid, at twelve o'clock at noon, and that you and each of you then and there show cause to this Honourable Court why administration of the goods and chattels, rights, credits and effects of the said David Murray, deceased, should not be granted to James Hamilton of Campbell town in Van Diemen's Land, aforesaid, merchant a creditor of the said deceased, or forever renounce the administration of the goods chattels, rights, credits, and effects of the said deceased, intestate, as hath been represented to us. Witness the Honorable John Lewes Pedder, Esquire, Chief Justice of the said Supreme Court of Van Diemen's Land, at Hobart town, aforesaid this 12th day of October, one thousand eight hundred and thirty seven. The property was again offered for sale, this time by the mortgagee. SALES BY AUCTION.TO BE SOLD BY PUBLIC AUCTION, By Mr. D. B. Falkiner, 0n FRIDAY the 22nd day of June, at 2 o'clock at his Auction Rooms, Campbell-town, by order of the Mortgagee, ALL that ESTATE, formerly in the possession of Mr. D Murray, called Twickenham consisting of 31 acres of Land, in cultivation, together with a substantial Dwelling House, Garden, Sec., and having a frontage on the Macquarie River. Terms :—Three months credit on an approved bills. For further particulars apply to the Auctioneer, or to Mr. James Hamilton, Campbell Town; or Messrs. Wickam and Home. To be let for a term of years, or sold by Private Contract. The fate of his substantial stone dwelling, Twickenham, has not been established but, to date, no trace of even the remains has been identified. It seems likely that its fate was sealed when ownership of the land passed to John Leake who wanted to expand his land holdings but had no need for an additional house. When David and family left Twickenham they leased and moved into the York Street, Launceston Wine Vaults, pictured above. After the death of David, Marion found herself with no money and she and some of the children went to live at Pisa with the William and Rachel Young family. William Young (b 1794 ) and Rachel Christie who came out in 1825 on the City Of Edinburgh. William’s younger brother Robert came out with Hugh Murray in 1823 and settled at Beverly and died there in 1826. William and Rachel Young at Pisa had nine children aged between 8 and 24 in 1840. Marion junior acted as a schoolmistress to one or more of the Young children. Family letters tell us, not surprisingly, that after several years there were tensions between the two families. When the estate was finalised in 1840 Marion finally had access to some money and she leased a house in Longford. She soon moved to another rented Longford house which was bigger and, being made of brick, better and cheaper although not as central. This is where daughter Isabella married Charles Harris in 1853. While other family also settled in Longford, in her later years Marion went to live with her daughters Martha and Margaret in their family home/school, Dunira in Tamar Street Launceston. This is where she died, forty years after the death of her husband David.